The Cisco PVC300 has been discontinued. No direct replacement is available. The Cisco PVC300 provides a feature-rich, highly flexible video solution for your business. 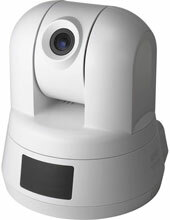 It provides full pan, tilt, and optical zoom capabilities to let you monitor any aspect of your business operations and virtually manage multiple sites from a central location. As an intelligent IP solution, the PVC300 also offers a wealth of advanced security, monitoring, and alerting capabilities that go far beyond what conventional closed-circuit television (CCTV) systems can provide.